Return on investment for advertising is always a prime consideration for companies, regardless of how wide the perspective audience or the size of the competition. 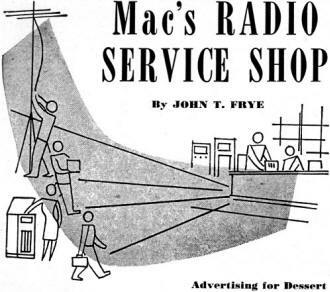 Luck plays some part in whether a certain advertising campaign is successful, but as Mac points out in the July 1949 edition of Radio & Television News, there is great advantage to measuring the effectiveness of each strategy. Advertising has never been cheap, especially in venues with a large contingent of followers. In the Internet age, one of the more popular schemes is 3rd-party pay-per-click ads that are served by a central distributor (like Google and Bing) based on intelligent algorithms designed by teams of business and marketing experts. Based on my conversations with some RF Cafe advertisers who have tried Google's AdWords program, most are not happy with the results because they experience a low ratio of clicks-to-sales. Those who report success are people who have expended a lot of effort learning how the system works and how to exploit it - often after learning the hard way what the wrong way is. Unlike his fellow radio service and sales shops operators in the story, it is doubtful many businesses would be willing to share their hard-earned secrets with competitors. Too many books and articles offering tips - as with those for job seeking advice or investment strategies - are typically written by theoreticians who have never actually run a business and/or an advertising campaign. 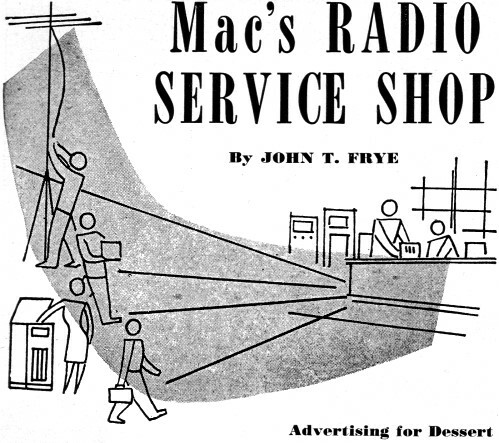 It was well after one-thirty when Mac, just back from his lunch period, strolled into the service department of his radio shop. He ran straight into an accusing look from Barney, his apprentice, who stood at the service bench pointedly tapping his foot and glancing at his wrist watch. "Boy!" Mac exclaimed, blandly ignoring this act and mopping his face with a handkerchief, "it's hotter out in that sun than a ballast tube's shell!" "You can talk plainer than that, and don't try to evade the subject," Barney said sternly. "Where have you been loafing?" "Say, Red," Mac said, ignoring the question completely and speculatively eyeing the boy's glowing thatch, "would you mind wearing some kind of a cover, say a snood, over that hair of yours these hot days? Every time I look at it, I feel just as though I were sitting in front of an open fire. "Oh, all right!" he suddenly broke down with a chuckle. "If you won't dock me this time, I'll tell all. The first and third Tuesday in every month, a gang of us radio service technicians have an informal little get-together over at The Dutchman's during our lunch hour. Every guy buys his own dinner; but after lunch, while we are messing around with the dessert, we talk about some phase of the service game. Each meeting we try to talk about a different subject. Today we had cherry pie a la mode and advertising." "Who started all this?" Barney asked suspiciously. "Well, I guess I did; and I'm glad," Mac replied. "It's working out even better than I hoped. It is funny how that so-and-so down the street, who was a chiseling, price-cutting, cold-solder-joint radio butcher before you met him, can turn out to be a pretty good sort when you look at him over a bowl of chili or a big plate of spaghetti-and-meatballs. It's strange, too, how you find out that he is getting gray hairs wrestling with the same problems you have, and how just talking things over with him seems to shrink those problems down to size. We are picking up new members every meeting day, and I should not be surprised if this thing grew into some kind of a service technicians' organization one of these days." "Did you get any new ideas on advertising along with that cherry pie?" "Lots of 'em," Mac admitted promptly. "For instance?" Barney prodded, "For one thing, we decided that the old saw about word-of-mouth advertising's being the very best kind for a radio service business needed considerable qualification. That sort of publicity has a lot of variables over which the service technician has no control. Its worth depends on how gabby your customers are, how many friends they have, and so on. In a large city, where very little neighboring goes on, the effectiveness of this kind of advertising is considerably less than in a smaller community where the people do more talking to each other. "Now do not get the idea that we are opposed to doing good work and behaving courteously so that our customers will recommend us to other people. Far from it! What we decided was that it was foolish to depend entirely on that kind of a business-builder. At best, it needs lots of time to do its good work. After a business is well established, word-of-mouth advertising can do much to keep it going; but other types are required to launch a new business or to pep up a puny one." "What are some good types?" 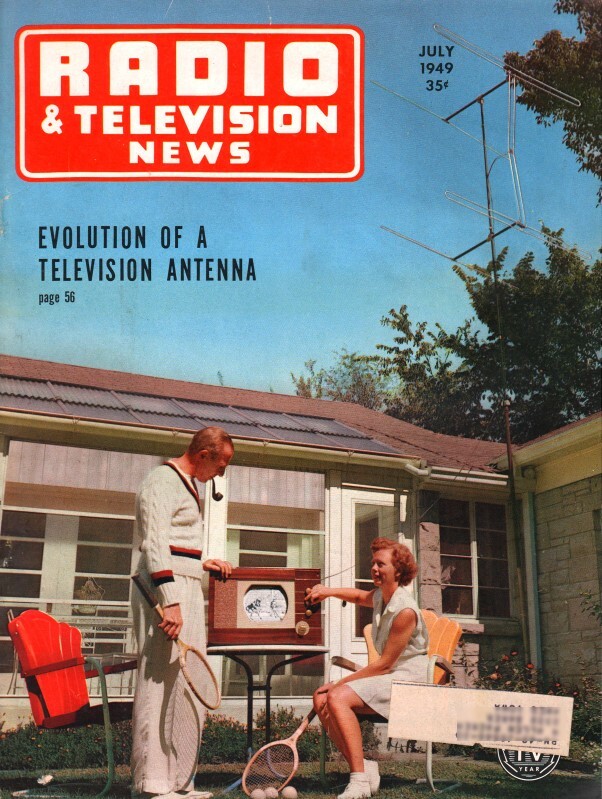 "Archie, of Archie's Radio Service, has spent more money on advertising than anyone else in town, and he has kept a pretty close watch on results; so all of us were interested in his opinions. He says that his most spectacular results come from direct-mail advertising. Those return-postage double-cards give you a chance to see exactly what results you are getting. He pointed out, though, that you had to watch little things in that kind of advertising. For example, he found that cards addressed by hand to specific persons brought in a far greater return than those addressed on a typewriter or those sent to the 'occupant' at a certain address. Apparently a lot of other people just glance at the less personal ones and throw them into the wastebasket. "He says that about the next best thing for quick results is a good-sized 'special' ad in a newspaper. For example, a Spring or Fall flat-rate, 'clean-and-check' offer invariably gets good results for him." "How about running a small ad regularly?" "Bill has a special angle on that sort of thing. He calls it 'riding the coattail of the national advertisers.' By that he means that he tries to tie in his own advertising with national advertising by big companies. As an example, the tube manufacturers have spent millions of dollars implanting in the minds of the people that good tubes mean good reception, and proof of how well they have done their job is contained in how often we hear that phrase, 'I think it must be a tube.' Bill runs a little ad continuously that simply says he tests tubes free of charge - meaning tubes out of the set, of course. He says this inexpensive little ad pays for itself in tube sales alone; but it also makes many new contacts for him and brings in several repair jobs when it is found the trouble is not in the tubes." "Does Archie think those big-as-a­bed-sheet calendars he puts out pay off?" "Yes, he is convinced that they do. He says that lots of people who call him say that they noticed the calendars. Those jobs cost better than a dollar each, and he says there are several angles to be considered. For one thing, he tries to put them into banks, beauty shops, license bureaus, and barber shops, as well as taverns, garages, and pool rooms. That means that the picture must be one that is acceptable in any company. In short, 'cheesecake' pictures are out. Another important point is to have the calendar hung in a good place. That is why he always 'happens' to have a tack hammer with him when he distributes a calendar and offers to put it up himself - in the best possible place, naturally! The guys were trying to tell that he wanted to hang one right in front of Judge Mull's bench, so that the judge would have to peep around it to see the jury!" "What do the fellows think about radio advertising?" "George is the only one who has tried it, and he says it is good, but tricky. Last month the radio station's advertising department fixed him up with one of those if-your-radio-is-noisy-let-us-take-the-noise-out-of-it-for-you spot announcements, and George said the results were amazing. The trouble was, though, that people wanted the summer static taken out of their sets! George said he took quite a beating on that, for he had to explain it was not that kind of noise he meant; but he turned the whole thing to his advantage by making several FM sales that would cure the static. From now on, though, he is going to weigh every word that goes into those commercials. "Lots of other points were brought up. Everyone said they used gummed stickers to go on the backs of repaired sets; and we all confessed that we carefully peeled off the other guy's sticker before we put on our own! Bob, whose store is on the main stem, told us about building a bean-sorting, electric-eye 'crowd-stopper' and putting it in his window. It brought him a nice increase in business and also a write-up in the local newspaper. "That started us riding Archie again about his knack of getting advertising 'for free.' Remember when his kid won the soapbox derby in front of the largest crowd the town has even seen, and the name painted on the winning car was 'Archie's Radio Service'? Remember how that name loomed up in the front-page newspaper picture? Then there was the time when he took those fine pictures of the ice-jam and let the newspaper use them on the condition that they give the shop a credit line. That made the front page, too. We decided that the rest of us could follow Archie's example by using our hobbies to get us some free publicity." "Fine!" Barney agreed enthusiastically. "Now take my hobby of collecting blondes: we could have a bathing beauty contest, and Margie could be 'Miss Mac's Radio Service Shop.' With me for a judge, how could she lose ?" Mac's only comment on the idea was to clutch his nose firmly between thumb and forefinger.